Today is a big day for me at You Did What With Your Wiener? Why? Well, for two reasons. One, today marks 6 years since I published my first blog post. Yes, 6 whole years! I take this blog very seriously and, for the last 6 years, I’ve written 99.9% of the articles myself. I won’t go into details but it means I’ve spent an average of 20-30 hours a week on this “labor of love” since it first began. It’s literally been a part time job. This brings me to the second reason that this is a special day. Today, I am happy to announce that I’ve brought on another regular contributor. Let me back up a little to earlier this summer. Not to toot my own horn but I get emails pretty often from people who have questions or want to tell me how much they love my blog. In July, I received a brief email from a girl that recently moved to Washington from Texas. She had been searching online for a hiking carrier for her Dachshund and discovered my article Backpacks for Carrying Dachshunds. I thought, “Huh. We sure have a lot in common,”; I admired her willingness to take a chance and put herself out there because I’m also a “create your own opportunity” and “you’ll never know if you don’t ask” person; and I responded briefly to her saying thank you but I didn’t have opportunities. I was pretty much like “that’s sweet” and then I moved on. A couple of months later, I was talking to another blogger friend about how much life had changed since we started our blogs. We agreed we just didn’t have the “free time” like we used to and we wished we could clone ourselves. Then I had a really big “Duh!” moment. I’m a person that believes things happen for a reason. I believe that people, and circumstances, show up in your life when you most need them. Here I was, lamenting about needing help but not being able to find anyone who had similar experiences, thought like I did, or had the writing experience I needed. But guess what? That person emailed me in July! I reached out to the girl again to say I changed my mind and ask if she was still interested in working for me. She was and she’s been helping me with research and various blog tasks for the last few months. We’ve been on a couple of hikes together and I really like her. On one hand, we are really different – she’s younger than I am (a millennial) and we grew up in completely different cultures (conservative Texas vs. the liberal west coast). We have several things in common though. 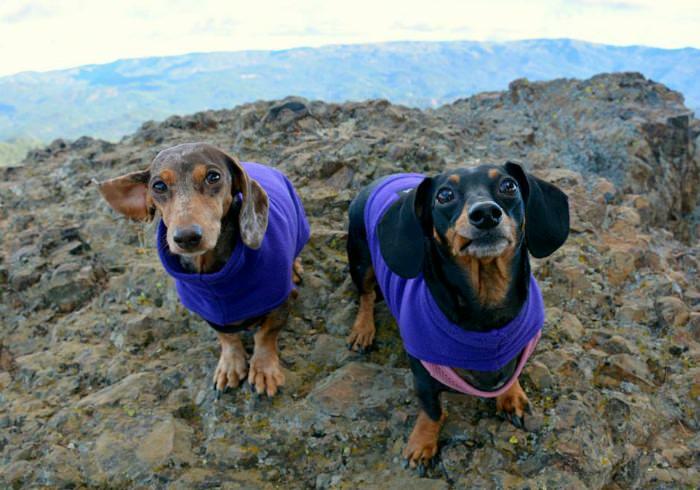 We both value kindness and respect, have a background in an environmental-related science, love writing, love Dachshunds, love the outdoors, and think that Western Washington is one of the most beautiful places in the country. In a few short months, we have grown to be friends. We discussed her eventually writing blog posts for You Did What With Your Wiener? in her own voice and from her own perspective. Well, today is that day (well, tomorrow, but I digress). You will now be reading articles on my blog written by Elena from time-to-time. She’ll still be helping me with behind-the-scenes stuff but I’m super excited that, after 6 years, there will be a fresh voice on this blog sharing her love of Dachshunds and everything outdoors. “Hi. My name is Elena and I have a 5.5 year old mini Dachshund named Mandy Moo. I like to keep it short and quirky so I just call her “Moo”, or “ZuZu” or “Squeeps”, or basically any off-kilter, rabbit-trail nickname that has derived from Moo (please tell me I’m not the only dog owner who does this). She’s a loyal sidekick with a devout love for all things human and tennis ball, and an equally strong distaste for sharing her space with big dogs and a stubborn will. For Dachshund owners everywhere, I’m sure this tell-tale “small body, big personality” description is all too familiar. Tomorrow, I’m publishing Elena’s first guest post. I hope you come back to check it out and learn more about her and Moo. Lastly, I want to thank all of you who have loyally followed us for a long time. I wouldn’t have been able to keep at this “part-time job” for 6 years without you. You’ve given me inspiration and been there for Chester, Gretel, and I when we needed your support. Here’s to 6 more great years! Very cool!! Can’t wait to read her post! Hey, that’s very cool!! Can’t wait to read more. And wow…you reminded me my 6th blog anniversary is right around the corner. I think it SO cool that my two fav bloggers are buddies! Happy Anniversary, y’all! Thanks for the kind words Nigel. I appreciate that you’ve followed me for most of my 6-year journey. Congratulations on your 6 year anniversary! That’s great you found a regular contributor for your blog I can’t wait to read the new posts. It sounds like they will fit seamlessly with your blog. Thanks Colby. You said you started a few years before me, right? I just checked. My first post was published on August 1, 2007. I wanted to get it started 6 months earlier on the day I brought home my first guide dog puppy, Stetson. Better late then never! I thought I remembered you telling me at BlogPaws that it had been almost 10 years for you. Good for you. Obviously, I know what it takes to keep going at this. Congratulations, Jessica! What a milestone…wait; TWO milestones. Six years, and an expansion! Congrats on 6 years, and I think it’s awesome that you connected with Elena; it sounds like she’ll fit in perfectly with your site. Your site has been such a huge inspiration to me, and I always look forward to reading your new posts. Thanks Jen. I’ve so tightly held on to personal control of my blog I never expected to have another regular contributor. Once I thought about it though, Elena was perfect. In fact, maybe THE only perfect person for the job. It’s funny how those things work out. Now I am looking forward to a whole new chapter for my blog. Congratulations! We have followed you on your journey and look forward to more! Congrats on your anniversary!! That’s awesome! Congratulations on both accounts! I am about to celebrate 4 years of Barking from the Bayou so I understand the time and dedication it takes. You are amazing. ☺ Welcome Elena, I look forward to reading your posts. Looking forward to reading Elena’s posts! Wow, Jessica, good for you! 2 congratulation are in order, 6 years of blogging, creating an amazing business, writing interesting articles for all of the dog community and now adding on an new amazing blogger. So exciting! I think it’s all great! Elena, I’m an Aggie too, my Dad was too. But I left Texas many moons ago for the mountains and wide open spaces of Colorado. You guys keep rocking it! Thanks Juliet. I’ve definitely become immersed in the online dog world since starting the blog. Congratulations Jessica!!! I love reading your blog & am forever grateful for all the customers that have come my way because they have read your blog. Not a week goes by that I don’t get an email that starts with” I read about your coats on..” Youdidwhatwithyour wiener…. Thanks for the great articles & tips???????? Wow! Congratulations on 6 years strong, Jessica. Though I only “discovered” you a couple of years ago, I enjoy your posts immensely, finding them at times informative, sweet, funny – you get the idea. And welcome to Elena and Moo; I look forward to her input here. Elena, yes, my Shaggy’s name morphs depending on my mood and the happenings around us: Shaggy-bert, Shagbert, Shaggers, S-dog, etc. His brother, Lucky, becomes Luckers or L-dog. Congrats to Jessica and Elena et al on this new chapter. Thanks Debra. I truly appreciate everyone who regularly reads my blog no matter when they joined our journey 🙂 Thank you. Welcome and congrats, Elena and Moo! And congrats to you too, Jessica, for getting some capable help onboard after a successful six years. I can’t wait to read about new adventures! Congrats on your anniversary. What a great accomplishment. I enjoy reading your blog and learning how to better care for my little wiener. Congratulations, Jessica, and welcome to one of my favorite blogs, Elena! Congratulations on all your achievements of the last 6 years! It’s easy to get caught up in all the “stuff” of blogging & have little time for yourself. I’m glad you have extra help to free up some time, I look forward to reading Elena’s posts as well as yours. Congrats Jessica! Simon and Dolly are my first dogs, so I had a lot to learn when we adopted them 7 years ago. You’ve been a major source of info and reassurance for me. Even though we’re not connecting as regularly, I want you to know we’re still out here cheering you on. Happy holidays! Thanks Jane. I was thinking about you guys the other day. I miss Simon and Dolly and chatting with you and Patrick once in a while. Do you think you might make a meetup sometime? If not, maybe we can find a day that won’t be wet and go for a little walk. Congratulations of reaching your 6th year anniversary! I know it wasn’t quite the anniversary you were planning but you made the most of it for sure. I think it’s great you’ve found Elena I look forward to reading more from her. Now you know what it’s like to have a friend a lot younger than you! I’m wondering have you done any more meet ups and met Sharon again? Congratulations on six years. We had five last month and totally missed it! I hope the additional blogger works for you. My readers are hung up on me. They don’t even like it much when my fur siblings are in posts and I am not. Everyone wants to see Emma, so I don’t see this as an option for us. It would be nice to have someone take some of the workload, though. It is so time consuming. We love it, but it really eats up time. I totally blew my 5 last year without a blink too 🙂 Yeah, it’s really hard for personal blogs to bring on other writers. I wasn’t sure what my readers were going to think but it turns out most of them are just excited about Dachshunds in general.